be connected to 50 mm pipework as well. Premium Slim Ponente linear drain 1200 mm is the lowest profile wet room drainage type we can supply. It's total height including waste trap is only 64 mm. Channel consists of flange and welded vertical frame. Modern design, slim grating and low space requirements are making it suitable and good looking in almost every shower. High capacity, welded siphon trap is integrated with the drainage. A textile sealing membrane is also included, allowing to achieve waterproof seal very easily. Premium Slim drain channel is 58 mm wide and comes with included Ponente grate type. It is plain stainless steel bar without any holes, only channels aside. That's the only visible part after the installation is completed. Frame is 12 mm high so is maximum thickness for finish material plus adhesive. Modern and convenient design with practicality for everyday use item. Total width with insulating flange is 96 mm and total unit length 1240 mm. Linear drain Elite is 48 mm wide and comes with included Ponente grate type. It is plain stainless steel bar without any holes, only channels aside. That's the only visible part after the installation is completed. Frame is 12 mm high so is maximum thickness for finish material plus adhesive. Modern and convenient design with practicality for everyday use item. Total width with insulating flange is 96 mm and total unit length 1140 mm. 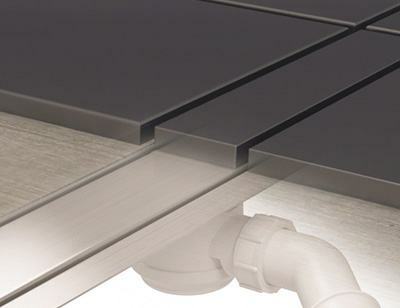 The SIEME linear drains are a series of elegant and durable, high-quality drainage systems. They are finished with an elegant frame and stainless steel grate with a width of 70 mm. The drains come in length of 600 mm. The product can be customized to match individual needs and tastes of the customers. Wall Upstand drain channel is 84 mm wide and it comes with included Tivano stainless steel grate. Tivano pattern features regurarly placed L-shaped rectangles with a square inside, which is 64 mm wide and 694 mm long and total drain length with insulation flange is 760 mm. Sealing membrane is a blue non-woven fabric which bonds well in the glue and is resistant to cracking. Premium Slim drain channel is 58 mm wide. Frame is 12 mm high so is maximum thickness for finish material plus adhesive. It has Sirocco grate included, which is patterned with two rows of squares parallel to the channel edges. They allows water to flow, look elegant and are very practical at the same time. Total width with insulating flange is 96 mm and total unit length 840 mm. Premium Slim drain channel is 58 mm wide and Mistral grate comes with it. Frame is 12 mm high so is maximum thickness for finish material plus adhesive. It is patterned with regularly placed circles of various size along the entire part length. The most decorated yet convenient and practical to use will fit to every walk in shower flooring. Total width with insulating flange is 96 mm and total unit length 940 mm. Premium Slim drain channel is 58 mm wide and Mistral grate comes with it. Frame is 12 mm high so is maximum thickness for finish material plus adhesive. It is patterned with regularly placed circles of various size along the entire part length. The most decorated yet convenient and practical to use will fit to every walk in shower flooring. Total width with insulating flange is 96 mm and total unit length 1040 mm. Premium Slim drain channel is 58 mm wide and Mistral grate comes with it. Frame is 12 mm high so is maximum thickness for finish material plus adhesive. It is patterned with regularly placed circles of various size along the entire part length. The most decorated yet convenient and practical to use will fit to every walk in shower flooring. Total width with insulating flange is 96 mm and total unit length 1140 mm. Premium Slim drain channel is 58 mm wide and Mistral grate comes with it. Frame is 12 mm high so is maximum thickness for finish material plus adhesive. It is patterned with regularly placed circles of various size along the entire part length. The most decorated yet convenient and practical to use will fit to every walk in shower flooring. Total width with insulating flange is 96 mm and total unit length 1240 mm. Linear drain Elite is 48 mm wide and comes with included Ponente grate type. It is plain stainless steel bar without any holes, only channels aside. That's the only visible part after the installation is completed. Frame is 12 mm high so is maximum thickness for finish material plus adhesive. Modern and convenient design with practicality for everyday use item. Total width with insulating flange is 96 mm and total unit length 1240 mm. Fitting Smart trap siphon with pipe made of stainless steel is welded to the drain, centered between both ends and in 90 degrees to the gully. Waste trap features 30 mm water seal and posibility to be cleaned from above, even after installation is completed. It can be connected both to 40 and 50 mm waste pipes as it has included proper converter. It high throughput drain and can take up to 38 l / min from your shower. Wall Upstand drain channel is 84 mm wide and it comes with included Sirocco stainless steel grate. Sirocco pattern which is considered to be the most practical pattern, features 3 rows of square shaped holes running parallelly to cover edge, which is 64 mm wide and 694 mm long and total drain length with insulation flange is 760 mm. Sealing membrane is a blue non-woven fabric which bonds well in the glue and is resistant to cracking. Chat started. Session ID: 1556194591. You are now connected to: David M.